The Brits have long been famed for their stiff upper lip. Americans, meanwhile, are thought to be more adventurous. 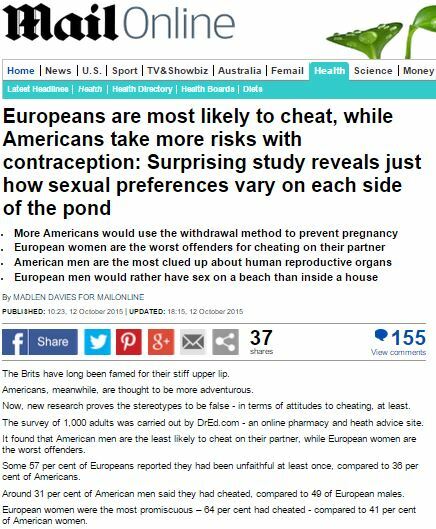 Now, new research proves the stereotypes to be false – in terms of attitudes to cheating, at least. The survey of 1,000 adults was carried out by DrEd.com – an online pharmacy and heath advice site. What is it with online pharmacies using suspicion of cheating to get their names in the press? First it was Medexpress and their scaremongering over STIs, and then there was the less-prominent PR effort by UK Medix telling of the many lies partners tell to cover their cheating, and now this from Dr Ed.com. Is there really no other way to remind people that you can buy johnnies over the internet other than to make them think their partner is a STI-infected lying adulterer? This entry was posted in Dr Ed. 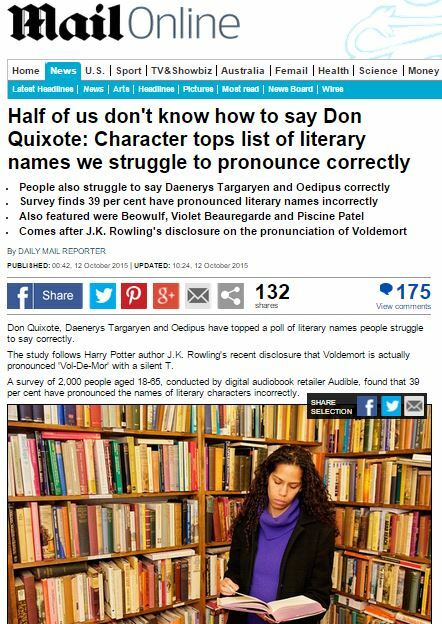 and tagged daily mail, Dr Ed, Madlen Davies on November 4, 2015 by Michael Marshall. There was a time when crazy paving and avocado bathroom suites were seen as the must-have additions for your dream house. But today’s homeowners are yearning for some rather more modern home improvements, with home cinemas and wet rooms now high on the wish-list, a study has found. When asked what they would add to their house if they could, 44 per cent opted for a state-of-the-art entertainment zone with supersize screen and games consoles, just ahead of a wet room at 43 per cent. The survey of over 2,000 homeowners, commissioned by Anglian Home Improvements, looked at how our tastes in home improvements and the way in which we use our homes have changed over the past 50 years. Anglian Home Improvements are just the company I’m thinking of, I guess. We know this, because they’re company who placed this particular piece of PR into the national news. If there’s one thing that’s for sure it’s that Anglian’s desire for improvements stops at home, as they clearly have no concern for the degrading state of the national press while they use newspapers to publicise their adverts. 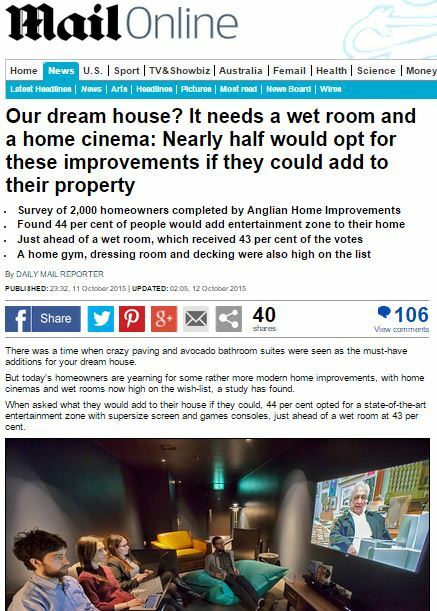 This entry was posted in Anglian Home Improvements and tagged Anglian Home Improvements, daily mail, daily mail reporter, Melanie McDonald on November 3, 2015 by Michael Marshall. 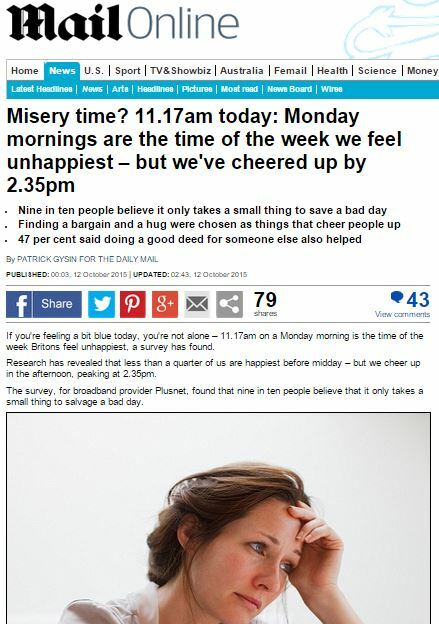 If you’re feeling a bit blue today, you’re not alone – 11.17am on a Monday morning is the time of the week Britons feel unhappiest, a survey has found. Research has revealed that less than a quarter of us are happiest before midday – but we cheer up in the afternoon, peaking at 2.35pm. The survey, for broadband provider Plusnet, found that nine in ten people believe that it only takes a small thing to salvage a bad day. So while the lead of the article is about how unhappy we are, the real hook of the story is the little things that can pull us out of a slump… little things like, apparently, “stumbling across a bargain”. Andy Baker, Plusnet Chief Executive added: ‘At Plusnet we understand the importance of giving back to our customers and know it’s the small things that make a big difference. It’s fair to say the Daily Mail have taken up Plusnet’s challenge to give something to someone: they’ve elected to give Plusnet space in a national newspaper where they can pretend their advert is news. Also, nice to see media-friendly PR psychologist Jo Hemmings popping up to prop up the advert with the illusion of science, as a little extra PR bonus. 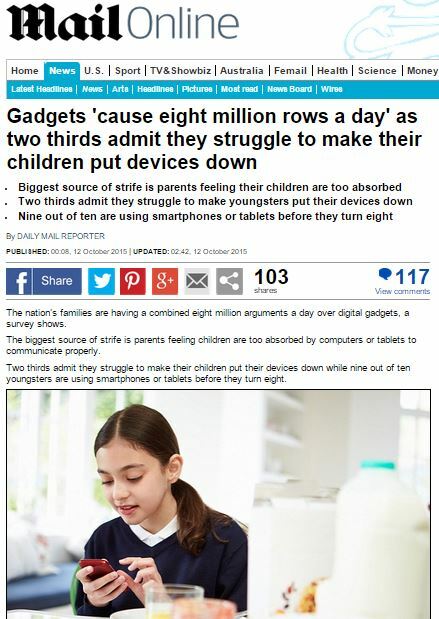 This entry was posted in Plusnet and tagged Andy Baker, daily mail, jo hemmings, Patrick Gysin, Plusnet on November 2, 2015 by Michael Marshall. Some prefer it black, others like it flat and white and there are those who add a myriad of syrups , foams and flavourings to it. Whichever way you look at it coffee is a big business with UK consumers drinking 70 million cups a day – a habit which adds up to a £730 million annual caffeine spend. 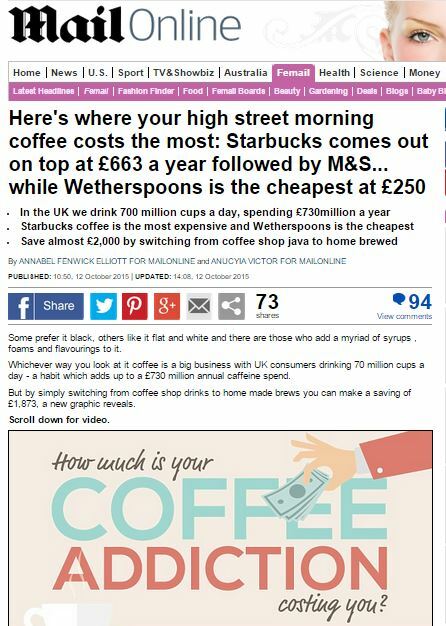 But by simply switching from coffee shop drinks to home made brews you can make a saving of £1,873, a new graphic reveals. It’s time we all woke up and smelled the coffee – the overly-expensive, coffee-shop-bought coffee, naturally. Is our coffee addiction really leading us on the road to financial ruin? Or might there be another culprit? The graphic by BuddyLoans.com also has some rather interesting facts behind the coffee, stating that with global consumption of coffee coming up to 400 billions cups per year. 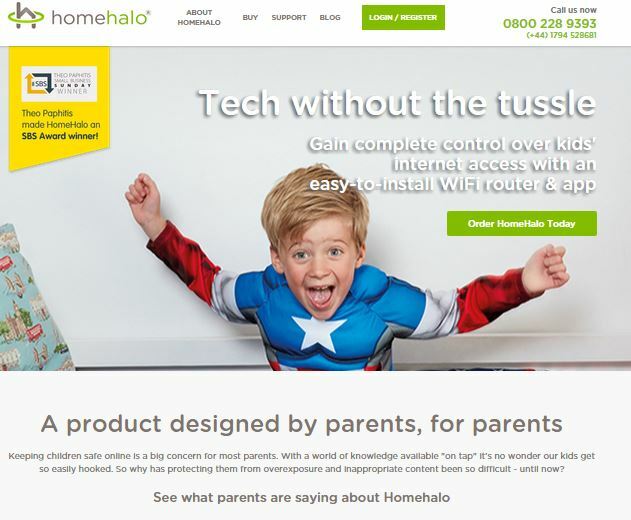 This entry was posted in BuddyLoans, Infographic and tagged annabel fenwick elliott, Anucyia Victor, BuddyLoans, daily mail, Jon Emge on November 2, 2015 by Michael Marshall.